If you're a fan of Parks and Recreation, you've probably heard of Galentine's Day. Created by Leslie Knope, it's a day set aside specifically to honor ladies and lady friendships. Today is that day: February 13th. 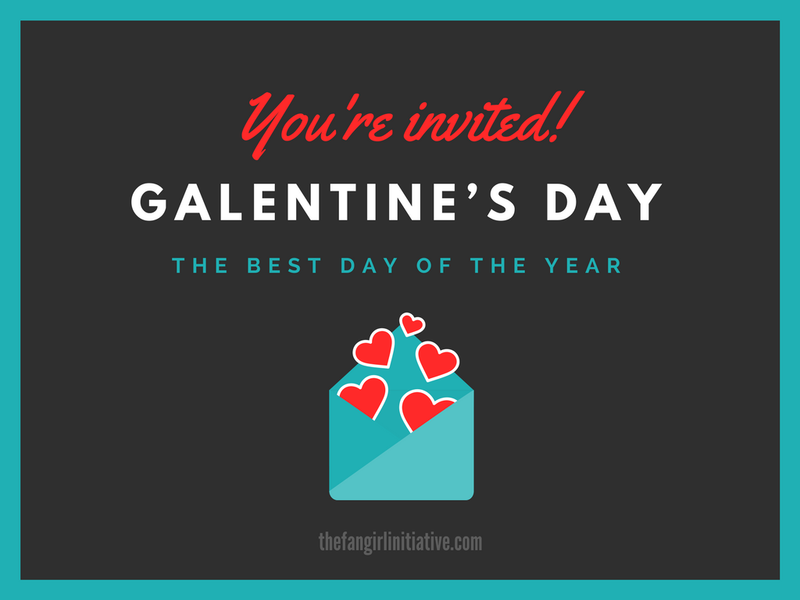 It's not yet Valentine's Day--it's Galentine's Day, my friends, and in honor of that day, we've gathered together to celebrate with our fellow lady friends, fictional and non-fictional alike. Would you join us? Galentine's day is a wonderful day filled with breakfast food and laughter. Here are three fictional ladies that I'd love to take to JJ's diner for waffles and conversation. 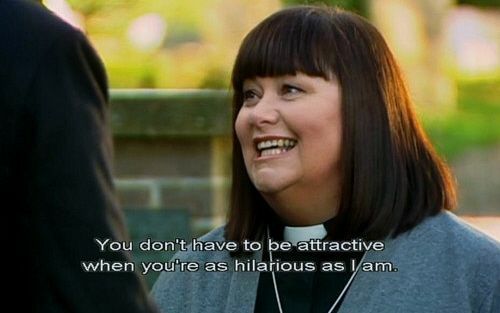 Geraldine Granger (Vicar of Dibley): Gerri, portrayed by the lovely Dawn French, is a Vicar of the Church of England and assigned to the tiny village of Dibley. She's the type of woman any Galentine's bash needs on their team. Being a female pastor in a backwater parish has definitely made her show the ability to put up with anything. Her position has also given her plenty of interesting stories to share and keep all of you entertained. Geraldine is the member of the friend group that gets you through whatever life has to throw at you and keeps you laughing the whole way. That, and she and her very comfortable couch are just a phone call away. Lily Aldrin (How I Met Your Mother): I'd say that Lily is invited to my Galentine's bash mainly because we have such similar personalities. I'd love to talk about her friend group and discuss our menfolk. She's not afraid to follow her dreams or make mistakes, which is admirable. Lily would be able to encourage me as well as the other ladies eating breakfast with us that eventually we will get where we need to be. Over the course of her series, she went from being a Kindergarten teacher to running away to San Fransisco to be a painter (and failing) to eventually becoming an art curator. The road to finding your place is often winding but that doesn't mean you shouldn't enjoy the journey. 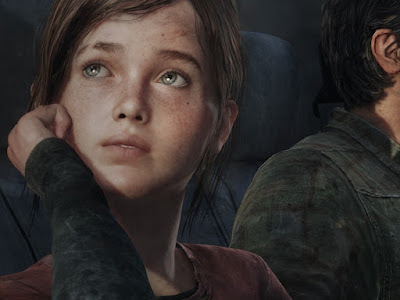 Ellie Williams (The Last of Us): What would Galentine's Day be without including the next generation? Ellie is a 14 year-old survivor of a zombie apocalypse. After spending quite a bit of her life fighting to stay alive, I think she definitely deserves a day to eat pancakes with people that aren't trying to kill her. She's a sweet and funny girl, who loves comic books and can fend for herself. I'd try to find a way to sneak a doggy bag and a new pair of shoes into her backpack without making her feel weird about it. After all, what is Galentine's Day about if not looking out for each other? A tea party with Alice, Emma Woodhouse, and Lucy Pevensie. A shooting range with Princess Leia, Peggy Carter, and Nancy Wheeler. An art gallery with Rapunzel and Lia Betarrini. Video games with Felicity Smoak, Cress Darnel, and Iku Kasahara. Fencing with Rey, Gabi Betarrini, and Eowyn. The library with Hermione Granger, Yuki Nagato, and Belle. Stargazing with Uhura, Wendy Darling, and Meg Murry. Horseback riding with Puck Connolly, Arwen Evenstar, and Laura Ingalls. A poetry reading with Elizabeth Bennet, Luna Lovegood, and Anne Shirley. A scavenger hunt with Blue Sargent, Katniss Everdeen, and Annabeth Chase. Piracy with Gamorra, Lila Bard, and Iko. Saving the world with Wonder Woman, Violet Parr, and Kamala Khan. Like I said, the list could go on and on. There are so many possibilities for celebrating the best lady friends a fangirl can have. For me, I’d enjoy any of these options and more. But in the end, it’s not about how you celebrate, it’s who you celebrate with. Oh, and don’t forget about the waffles! There’s really no one I’d rather spend Galentine’s Day with than Lizzy Bennet. Who better to celebrate with than a fellow sassy book nerd who can hold her own against any man or woman? But since two people isn’t really a party, we’d invite Lorelai and Rory Gilmore--because you can’t have one without the other--and if anyone can throw a party and celebrate female friendship, it’s these two. Plus, they know all the best places to get food and coffee--two very necessary parts of a great Galentine’s Day celebration. I can’t even imagine all the quick banter and bookish references and bad date stories that would happen in that food-filled room. Actually, I totally can. And it would be amazing. Who doesn't want to spend a Galentine's Day with their favorite fictional characters? I have so many that I would love to gather together, but today I've picked three. My first is, of course, Leslie Knope, the original Galentine. She's positive, uplifting, and funny. It would be an honor to spend a day with her, the creator of Galentine's Day itself, and my personal inspiration. My second choice? Jane Villanueva. Sweet, hilarious, and overall a precious cinnamon roll, Jane is one person I would love to spend a day with. We could talk writing, which would be absolutely amazing. And I could give her a hug, which is something I find myself really needing to do these days. Plus, I just adore her, and I would adore spending time with her even more. And finally, because every party needs some fun, I'm inviting our favorite TV mom, Linda Belcher! ("Alriiiight!") Linda brings life to every day and injects positivity into even the most ordinary situations. I feel that she would add a source of energetic fun to our adventures--plus get us into some adventures we might not have seen coming--and I would love to hear the song she'd make up about our shenanigans. Which fictional characters would you want to spend Galentine's Day with? *GASPS* YOU BEGAN WITH GERALDINE NO ONE HAS EVER TALKED ABOUT HER TO ME BEFORE OH BLESS YOUR SOUL BLESS YOUR SOUL SHE IS SO AMAZING AND SO IS ALICE ACTUALLY BUT BLESS YOU FOR MENTIONING HER OH GOODNESS I LOVE HER QUITE A BIT. Less than capital letters warrants, really, but she shows up so rarely I decided to decorate the occasion. Also hi to Princess Leia, Rapunzel, and Uhura, because they are also awesome. AND OOH LINDA BELCHER YES SHE'S A GREAT CHOICE TOO.